The Wild winger picked a hell of a time to figure out this whole "playoffs" thing. He scored his first postseason goal in the third period to tie up the game, and in overtime, he scored his second to give the Wild a 5-4 win and a 4-3 series win over the Colorado Avalanche. He was beaten twice, and the losing goaltender in the New York Rangers' 2-1 Game 7 win, but anybody who watched this game knows the only reason it was this close is because Mason stood on his head. He was incredible, especially in the second period. He deserved a better fate. Did You Know? The first round of the playoffs were incredible. Absolutely incredible. That is all. 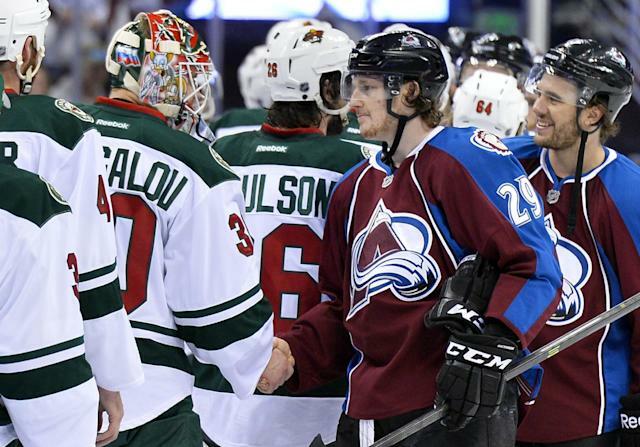 Dishonorable mention: The Avalanche had four leads versus the Wild... The San Jose Sharks. How could they let this happen? How? I don't know. They don't know. This gif from a heartbroken, world-weary Joe Thornton says it all. You can almost see his soul logging off.